toward the end of the order process. In Partnership with Church Hill Classics, CDS Images is now offering a variety of "Pride" logo photo frames. At this point, frames are only available for 4x6 and 5x7 prints (vertical and horizontal). Frames for other sizes will be added in the near future. 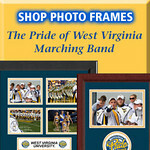 Check out http://frames.wvuband.org to view frame options. Simply click the Buy button and select This Photo from the menu. Be sure to click the + sign for each product you'd like to add to your cart. Click Checkout if you're ready to finish your order, or click Back to Photos to keep browsing. Orders for photo prints are handled by Smugmug.com. These are high quality photos printed by Bay Photo, an award winning lab in Georgia. Photos are printed with a Lustre finish. Lustre is a premium finish on a heavier paper. It offers the vibrant colors of glossy with the fingerprint-resistant finish of matte. Printed on Kodak Supra Endura paper. If you are ever dissatisfied, you can return your prints for a full refund. Photos are mostly in a 4 x 6 aspect ratio as shown in example 1. For this reason, 8 x 12 prints are being offered which will give you a 20% larger view without cropping the image. As you can see in example 2, if you order an 8 x 10 an inch of each side will be cropped. Cropping will also take place if a 5 x 7 print is ordered. As you can see in example 3 only a small portion is cropped. The "adjust crop" button allows you to crop the photo to match the print size you choose. Choose which credit card to pay with, where you want your items shipped, and what shipping method you want. The secure server at Smugmug makes your transaction safe. Photos usually ship within a few days of order. Depending on the shipping method you choose, items can be in your hands in a little as a few days. You'll get a confirmation from Smugmug confirming the order details and they will give you an expected shipment date. You will get a confirming email when your order ships. Prints will be packaged in cardboard envelopes. Kudos to Smugmug, their packages are done with exceptional care to make sure your order arrives in first class condition. If you have any additional questions please feel free to email us at chris@cdsmediasolutions.com. However, any questions regarding order fulfillment should be directed to Smugmug's customer service at help@smugmug.com - as we have no involvement with the actual order handling/processing. All products are guaranteed - Smugmug will either replace any print you are unhappy with or return your money. However, if you do have a problem please let us know as well.